On Thursday 17th September Project Nomad left Quickfit Motor Sports on a flat bed heading for Joscar Smash Repairs and Restorations for the next phase of the build. Tony had managed to sort out everything on the chassis, drop the body and get it all plumbed in a timely fashion. 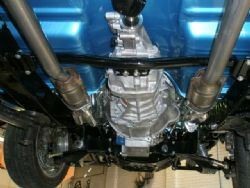 After I had painted the chassis, diff, four link rods and the transmission cross member all the A arms, calipers, wheels and petrol tank were installed for the final time. 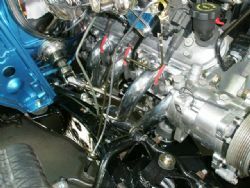 Next up he ran the fuel lines and swapped out the pump in the tank for a better unit which negates the need for another external pump to feed the LS2. The custom fabricated steel pipes between the filler cap and petrol tank were reinstalled and in the not too distant future I will paint these with POR 15 as well. The brake lines were then run to all four corners and hooked up to the braided lines running off the disk brakes. These were plumbed into the master cylinder once the body was dropped back on the chassis. Just before the Nomad left Quickfit the brake fluid was added and the process of bleeding the entire system started. This tested Tony’s patience but in the end he got a pedal and it was able to be steered onto the flat bed with working brakes. The full exhaust was installed with cats set up just behind the extractors. 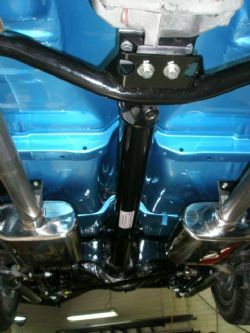 Dual two and half inch pipes flow from the cats through stainless mufflers and exit on either side at the rear. I sourced the rear bumper bar and brackets to measure how far out the back we wanted the pipes to come and after a quick measurement Tony set the last section of the exhaust in place. 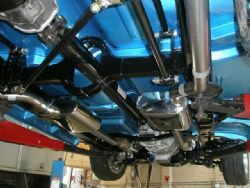 Prior to bending any pipes he had already pre-fabricated the mounts for the exhaust hangers and the stainless system should last for many years to come. Various other bits and pieces were wrapped up and Project Nomad was on its way to get a slick coat of paint at Joscar. It didn’t take long to fill my boot with all the numerous parts and some of the old stuff that had come off the wagon and at some stage I will need to go through the boxes to see what will be jettisoned as land fill, what may end up on eBay and what will be kept.